The total bath tissue market is worth R2.4-billion in value. The category consists of both 1-ply and 2-ply with 1-ply losing share while premium bath tissue is gaining share. Despite its high value, the toilet paper category in South Africa lacks innovation due to the fact that it has always been regulated but since March 2012, you can expect some exciting innovation as the category has been re-regulated. South Africa was one of only three countries in which the toilet paper category was regulated. This meant that 1 Ply toilet paper had to be 500 sheets and 350 sheets for 2ply. These regulatory restraints restricted manufacturers of toilet paper to develop innovation within this category. To overcome these constraints, branding and innovation members of the Tissue Manufacturers Association approached the regulating body to de-regulate sheet count or re-regulate to allow for more variants. This was approved in March 2012 and the new regulations allow smaller counts on both 1-ply and multi ply. 1-ply rolls can now have 300 sheets, 500 sheets and multiples of 100 sheets per roll above 500 sheets while 2-ply rolls can offer 200 sheets, 350 sheets and multiples of 100 sheets per roll above 350 sheets. 3-ply rolls will have 200 sheets and multiples of 10 sheets per roll above 200 sheets. The core diameter and sheet size remain the same as before. 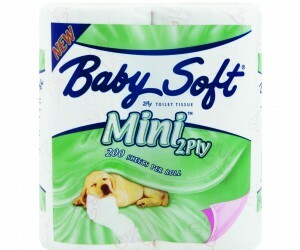 The main benefit of the new Baby Soft® Mini™ 2-Ply is to consumers who previously could not afford 2-ply toilet paper and are now able to trade up from 1-ply. It also allows them to have access to improved product leading to improved hygiene and comfort, access to more cost-effective products and a larger variety to choose from. There are also numerous benefits to the category as well as retailers. Category growth will be stimulated through increased penetration of the total market, premiumisation as well as increased consumption. It will allow retailers better and more appropriate solutions, as well as the ability to differentiate by channel and shopper. Kimberly-Clark, the manufacturers of Baby Soft®, is a thought leader and drives innovation in the toilet paper category globally. “With this re-regulation we are finally in the position to do the same in the South African market,” says Li-Anne Hide, the Senior Brand Trade Activator for Baby Soft®. “The regulated toilet paper category has limited Kimberly-Clark South Africa and we are now able to drive penetration and innovation with the re-regulation. Our first step is to get more South African consumers to use 2-Ply. This is why we have launched the new Baby Soft® Mini™ 2-Ply,” says Hide. 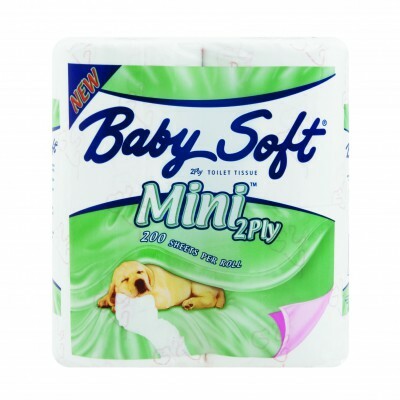 The Baby Soft® Mini™ 2-Ply product is a smaller sheet count roll of 200 with the quality and softness you know and trust from Baby Soft®. This is the perfect product for the consumers who cannot always afford to buy 2-ply toilet paper. They can now afford to give their family the best of 2-ply toilet paper at an affordable price. It is available in white and blue 9’s and pink and white 4’s and the RSP is R32.99 for a pack of 9’s and R14.99 for a pack of 4’s “We want consumers to be aware of our new 200 offering which is why the packs are fresh and exciting as well as easily recognisable,” says Hide. The green design ensures you don’t confuse your original 350 sheets blue pack with this new addition. “We have clearly communicated the difference between this product and the original Baby Soft® 2-ply toilet paper to ensure our consumers always know what they are purchasing,” concludes Hide.